Don Alberto Valdivieso founded his winery in 1879 and at first it was exclusively a sparkling wine house. They still produce sparkling wines today, however the winery is now equipped with all the technology to produce high quality still wines as well. The grapes for their wines come from a 250 hectare estate vineyard called "La Primavera" where they produce Pinot Noir, Chardonnay, Semillon, Viognier, Marsanne, Cabernet Sauvignon, Merlot, Syrah, Malbec, Cabernet Franc, and Carmenere. 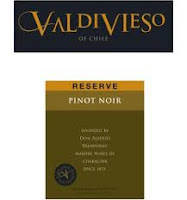 The 2009 Valdivieso Pinot Noir Reserva is 100% Pinot Noir from Chile's Casablanca Valley D.O. It was aged in French oak barrels for a period of 12 months before bottling. The wine is a lightly colored and translucent red and contains aromas reminiscent of red raspberry, red currant, cranberry, chalky earth, and hints of dried herb. On the palate the wine is bursting with fresh red raspberry and black cherry flavors, hints of soil and leather, and a touch of dried herb. The finish is tart and fresh with flavors of raspberry and cranberry that linger along with a dab of tannin.